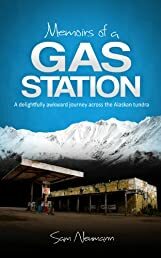 Memoirs of a Gas Station: A Delightfully Awkward Journey Across the Alaskan Tundra | Your #1 Source for Kindle eBooks from the Amazon Kindle Store! Early one May, Sam Neumann arrived in the breathtaking wilderness of Denali, Alaska with a smile on his face and adventure in his heart. But less than 24 hours later, both had evaporated as he stood behind the counter of a filthy gas station—his new place of employment—and tried to piece together what exactly had gone wrong. MEMOIRS OF A GAS STATION is a quirky personal account of a summer trapped in a convenience store on the edge of Denali National Park. It is a journey across the Alaskan tundra and headlong into the ridiculous world of seasonal employment. The summer began with shock, horror, and denim shirts as Sam struggled to accept his new role as a gas station employee. To escape it, he took to the forests of Denali at every free moment, soon finding himself face-to-face with an angry adult moose, shivering numb trying to last the night on a frigid mountainside, and being seduced by a Mormon divorcee. Often satirical, sometimes introspective, and always brutally honest, MEMOIRS OF A GAS STATION takes you on a raucous ride through the best and worst summer of one man’s life. From booze-soaked employee parties to one very awkward romantic episode in a tree house, Sam learned more than he ever planned about the Last Frontier. But weekends spent stumbling through seedy Alaskan bars and hitch-hiking to remote destinations gave him a unique perspective on life, and led him to find friendship, adventure, and love in the most unexpected places.